Hospice is a patient-centered, family-oriented approach to care for people with a life-limiting illness. Using a combination of medical, emotional and spiritual support, hospice is comfort-oriented care that neither hastens death nor prolongs life, but allows the illness to take its natural course. For families, hospice provides extensive support both before and after the loss of a loved one. Hospice care is for people who have chosen comfort-oriented care over the pursuit of further curative or experimental treatment. Anyone who is diagnosed with a terminal illness, and whose life is most likely measured in months rather than years, may select hospice care. We recommend that those dealing with a potentially life-limiting disease reach out to HospiceCare of the Piedmont long before our care is needed, so that they can take their time absorbing the information and asking questions. Understanding the hospice option enables those living with terminal illness and their potential caregivers to make fully-informed decisions regarding their care. How do I choose Hospice for a loved one or myself? Anyone (the patient, a family member, a friend or healthcare professional) can call Hospice with a referral. The hospice intake staff will need the name of the patient’s physician. Or use our online form to make a referral. Can I still see my doctor if I join the Hospice program? Absolutely. We encourage it. Our team works in partnership with your physician and other health care providers to provide you with the most comprehensive care possible. Hospice services are paid through Medicare, Medicaid, HMOs, many private insurance plans and personal payments. Through generous donations from the community, HospiceCare of the Piedmont is able to continue the mission of caring for all who need us, regardless of their ability to pay. We come to our patients, wherever they call “home.” Most often, we provide care in the patient’s own home, or that of a family member. However, we will care for patients in assisted living facilities, nursing homes, hospitals or at our Hospice House. Is hospice just for cancer patients? No. In addition to cancer, we provide comfort-oriented care to patients and families living with any type of terminal diagnosis, including Alzheimer’s, dementia, stroke and chronic lung, heart, liver, kidney and other diseases. Hospice nurses are up-to-date on the latest medications and devices for pain control and symptom relief. They work closely with the patient, family and physician to assure optimal comfort using medications, counseling and therapies. What if the patient improves or wishes to pursue curative treatment? If the patients condition improves and the disease seems to be in remission, or if they reconsider their decision to pursue curative treatment, patients can be discharged from hospice. 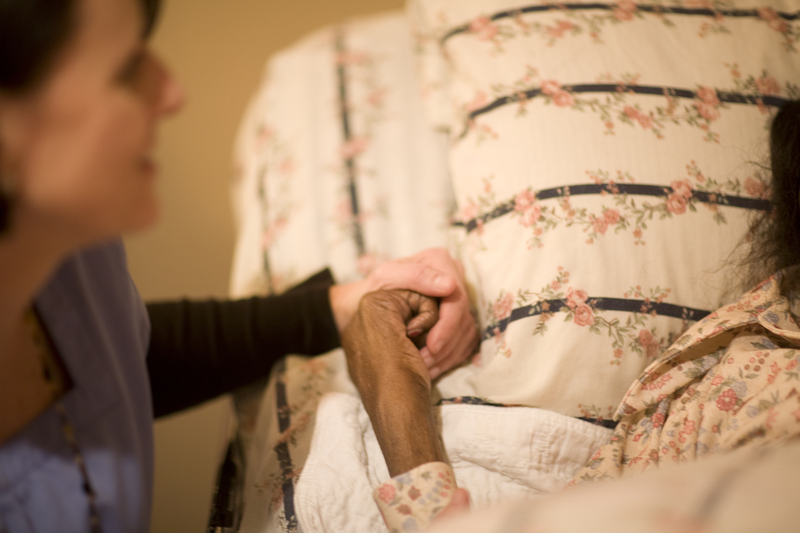 If hospice care is needed again, we can re-enroll the patient on the program.